Our involvement from the start enabled us to save the client money and time. An interesting challenge for many budding entrepreneurs or manufacturers can be packaging a new product to test the market before then going into longer production runs. 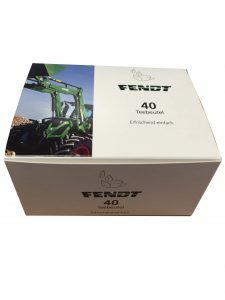 One such project was for a marketing campaign for Fendt Tractors, via an agency who offer a branded foods service, we were asked if we could create branded packaging to hold teabags which would be sent to dealerships around the world. This were a free promotional gift which had to maintain brand consistency but also in 8 different languages which meant splitting the 2500 quantity into runs as low as just 85 copies! Fortunately we have considerable experience in this and we came up with a proposal that saved the client money whilst still delivering the product they wanted. Instead of printing 8 different boxes we noticed the artwork remained mostly the same and the language change was contained mostly in the black ink areas. Our proposal was based on a standard set of 4 colour plates and simply changed the black plate to change language and run for the the relevant amount of copies before the next plate change and so on. This limited the number of plates that were required, the cost involved and this made the project a viable marketing campaign based on ROI. A logistical edge also came along with this as the languages had to be kept separate through 5 different processes! 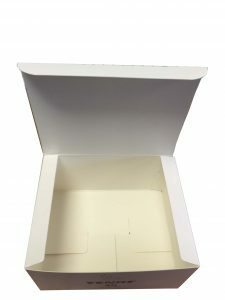 The boxes were indeed printing using our lightcure technology so we instantly dry and had no spray powder, giving the print a much brighter and smoother finish than traditional litho print. For more information on our lighter print process see here. 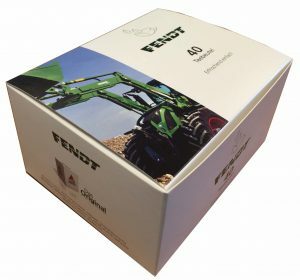 The ability to create a bespoke packaging product is something people aren’t always able to find in a print supplier, we have been able to tailor our box printing services to suit this market, which in this instance meant a project was able to go ahead. Using traditional packaging manufacturers would have been prohibitive expensive and their appetite for a project like this would be very limited.